XAMPP is a free and easy to install software used to run PHP and MySQL applications. It includes apache to run PHP files, MySQL for easy management of databases and PHP. XAMPP is similar with WAMP Server that runs on Windows, MAMP for Mac and LAMP for Linux operating system. Before we start, download and install first the latest version of XAMPP from apachefriends.org and install it in your Windows PC. 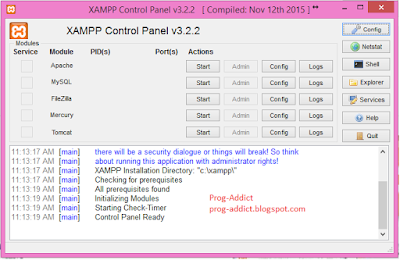 Run the XAMPP Control Panel or search it in your computer. The control panel looks like on the picture below. Start the apache and if you are going to use MySQL for your database, start the MySQL also. Create your PHP script using any text editor. In my case, I do use notepad++ which can be downloaded on their official site. directory with .php file extention. Just copy the script above and save it for example sample.php. To be able to run your PHP scripts, open any browser and type http://localhost/sample.php on the address bar and press enter. haixt ari man lang di gale ms.